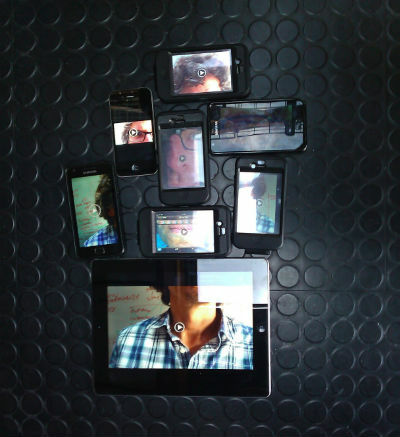 He started to build a platform for playing synchronised videos across mobile phones, tablets and fixed screens. Running against the trend for people to communicate remotely, these multi-device, multi-segment, multi-viewpoint films are for people to enjoy and discuss together in social, co-located groups. Nth Screen films are adaptive: each of us unlocks part of the film by connecting our device; the other devices respond to their presence, to reveal further film segments. Tim had been working on multi-screen apps for some time — from back in the 80s, actually, when he did his PhD on Reconfigurable Distributed Computations, more recently with Steve Chamberlain on Heads, and on It’s the Skin You’re Living In by Fevered Sleep. Speaking of which, if you have an iPhone why not try the Nth Screen app we made for Fevered Sleep right now? Watch it with friends if you can.